The photojournalist says he'll always remember the moment the spire fell. "It's a sound I won't forget... that many people all sighing at once"
A vacationing photojournalist from New Jersey captured images of the fire that tore through Notre Dame Cathedral on Monday. Pei-Sze Cheng reports from Paris. He says he'll always remember the moment the spire fell. "It's a sound I won't forget... that many people all sighing at once"
The Wayne, New Jersey residents were on vacation, but they couldn’t ignore the alarming sound, he said. “People had tears and people had their hands over their hearts and their mouths. It was just quiet. Some people were singing,” she said. 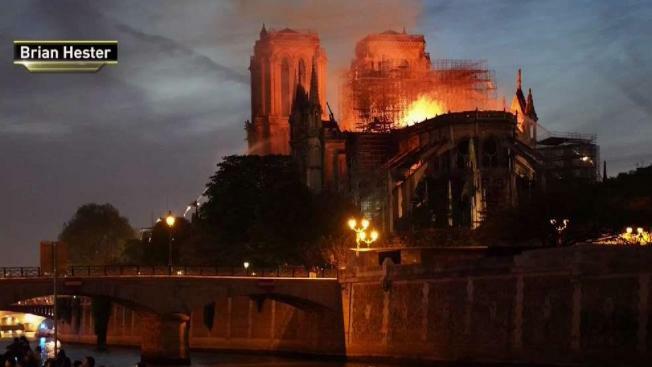 The fire at the beloved cathedral burned for more than 12 hours. French President Emmanuel Macron has vowed to rebuild the landmark within the next five years.